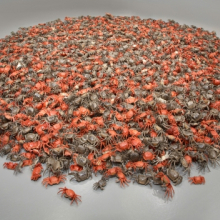 Brooklyn Museum: Ai Weiwei: According to What? While living in New York between 1983 and 1993, Ai was strongly influenced by the artists Marcel Duchamp and Jasper Johns. 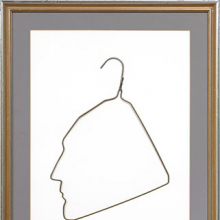 Profile of Marcel Duchamp in a Coat Hanger is a layered homage to both artists. Ai borrows two motifs from Duchamp—the readymade everyday object and the self-portrait of the artist in profile. He also makes reference to various works by Johns, who was similarly inspired by Duchamp. In 2011, Ai’s political activism, particularly his criticism of the Chinese government, led to his eighty-one-day imprisonment by Chinese authorities. S.A.C.R.E.D. is the first work Ai created in response to that imprisonment. 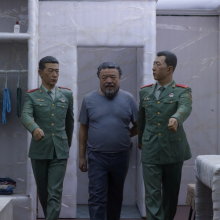 These six dioramas document the most painful and intimate moments of his detainment, including the moment he was led into his cell, the periods of interrogation, and the daily activities of eating, sleeping, showering, and using the toilet, all under the watchful eyes of two guards. The title connotes religious associations with ritual acts, sacrificial punishment, and perhaps even tomb burials. It is also an acronym. The letters stand for each diorama’s subtitle—Supper, Accusers, Cleansing, Ritual, Entropy, Doubt. In addition to corresponding to the daily activities represented, these subtitles evoke the life of Christ and the Stations of the Cross. At the same time, the exterior of the cell is reminiscent of Minimalist sculpture, while what we see inside is the most minimal human condition. This installation represents part of a series of eighty-one unique chests built from huali, the precious and highly desirable wood of the Chinese quince tree. The artist has cut four circular openings into each chest, transforming them from functional pieces of furniture into works of art. 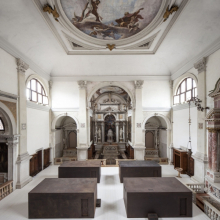 When the chests are viewed through the center from one end, the openings align to create a play of light and shadow that suggests the phases of the moon. 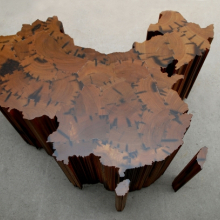 This sculpture is a map of China made of salvaged wood and built using traditional Chinese woodworking techniques. The work can be interpreted in a variety of ways. As a map of China, it symbolizes the political unity of a country made up of many different cultural and historical elements. The monumental scale of the work and the impossibility of viewing its complete outline from one perspective perhaps reflect the difficulty of grasping the full complexity and vastness of China. Ai moved to New York in 1983, first living in Williamsburg, Brooklyn, before moving to Manhattan. In the decade before he returned to Beijing, he took photographs of his daily life. 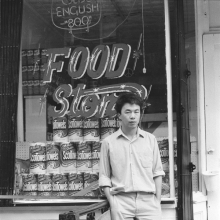 Some of his photographs document influential individuals, including the composer Tan Dun and the poet Allen Ginsberg. He also captured important events such as the Tompkins Square Park riots in 1988, scenes of political activism, and social problems such as homelessness. Other photographs reveal Ai’s interest in the artists Jasper Johns, Marcel Duchamp, and Andy Warhol, as well as notable twentieth-century art movements, in particular Dadaism and Surrealism. 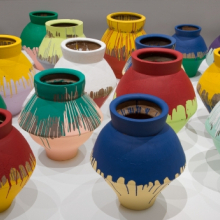 This series consists of Han dynasty vases dipped in industrial paints. The faded, richly patterned surfaces of the vases are concealed by the bright modern colors, but the vases retain their original forms. By leaving the vases intact and only altering their surfaces, Ai asks viewers to consider questions of authenticity and the value and meaning of an original artwork. 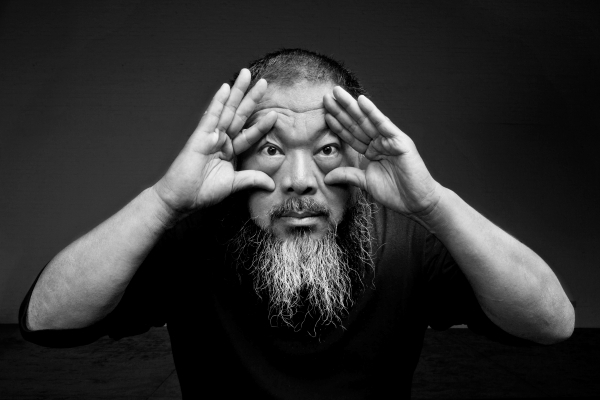 Ai Weiwei is one of China’s most prolific and provocative contemporary artists. 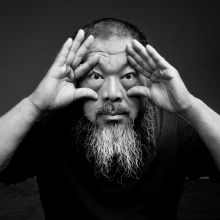 Featuring over forty works spanning more than twenty years, Ai Weiwei: According to What? explores universal topics of culture, history, politics, and tradition, showcasing the artist’s remarkably interdisciplinary career as a photographer, sculptor, architect, and activist. These works spotlight issues of freedom of expression, as well as individual and human rights both in China and globally. Many use minimal forms and methods, while others manipulate traditional furniture, ancient pottery, and daily objects in ways that question cultural values and challenge political authority. Ai is best known for projects such as his collaboration with Herzog & de Meuron on the 2008 Beijing Olympic National Stadium, as well as his embrace of the Internet and social media as a platform for his activism. Despite his arrest and eighty-one-day detention in 2011, Ai has continued to create art that transcends dualities between East and West. Ai Weiwei: According to What? is organized by the Mori Art Museum, Tokyo. It is curated by Mami Kataoka, Mori Art Museum Chief Curator, and the Brooklyn presentation is organized by Sharon Matt Atkins, Managing Curator of Exhibitions, Brooklyn Museum. This exhibition in Brooklyn has been made possible by Lisson Gallery, Mary Boone Gallery, the Andrew J. and Christine C. Hall Foundation, the May and Samuel Rudin Family Foundation, Galerie Urs Meile, and the Martha A. and Robert S. Rubin Exhibition Fund. Additional support is provided by the American Chai Trust for education and public programs. A team of art handlers and studio assistants put 700 bicycles together to create Ai Weiwei’s site-specific installation Stacked.